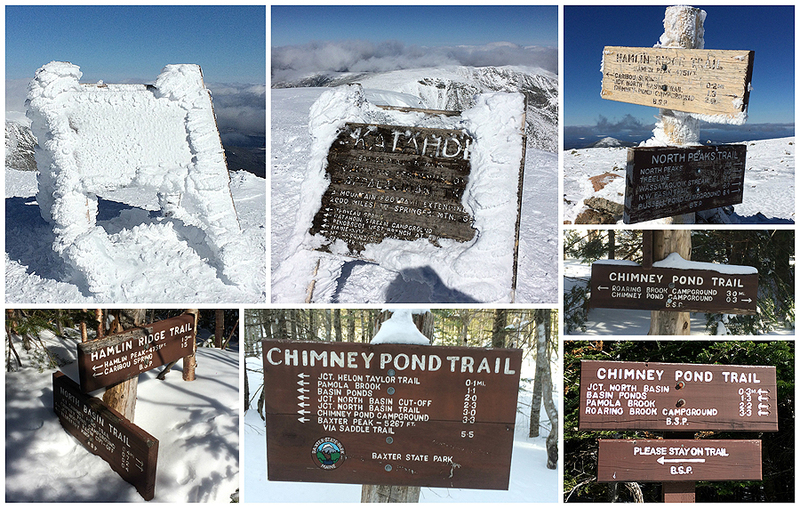 - There's winter hiking above 4,000 feet in New Hampshire, Vermont, and New York, and then there is winter hiking in Maine, more specifically Baxter State Park and the summit of Mount Katahdin. It's very remote and access to hiking it is very limited, so much so that requests for reservations have to be mailed in months in advance to try and land a spot in the coveted bunkhouse at Roaring Brook or Chimney Pond. Once you secure a reservation then comes the planning and pulk sled building, yes a pulk! 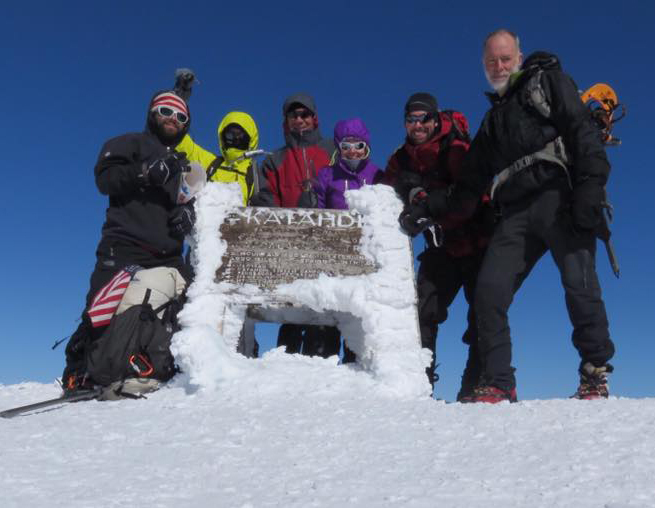 - There ended up being six very strong hikers in our group (Whitney, Tim, Kyle, Jason, George, and myself) so we had the ability and experience, now we needed a little bit of luck weather wise as successful ascents of Mount Katahdin in winter are around thirty percent. - As it turns out our four days and three nights in the park brought all kinds of weather...sun, clouds, wind, rain, and snow, four to six inches. Luckily, the hike pulling the sleds in was a beautiful day and our hike up Hamlin over to Baxter as an out an back was filled with a dramatic clearing and undercast giving way to abundant sunshine. The following is how it all transpired. - Whitney and I drive up from Gorham to meet Tim and Kyle for a night at Ruthies. We both had time to kill in the afternoon so we drove the Golden Road to Abol Bridge to check out road conditions for the drive in to the winter trailhead. For those not familiar with the Golden Road it's a 96 mile logging road that parallels the West Branch of the Penobscot River, it's said to be paved the 32 miles from the Millinocket side to Ripogenus Dam but that is hit or miss, there's pavement, which was half covered with ice, and then there is chewed up pavement and dirt/mud littered with potholes, it looked as if a field of mini mines went off creating small craters in the road. - After what seemed like an eternity we made it to The winter trailhead and were treated to a spectacular view of Mount Katahdin from Abol Bridge. - The four of us had a big breakfast at Ruthies before heading back down Golden Road were we prepared our sleds for the hike in. I made a pulk sled for both Whitney and I, our pulk was made from a Paris Company Expedition Sled, bright orange and five feet long. I then purchased two six foot long fiberglass poles, anchor fasteners, u-bolts, joining the poles and anchors together with epoxy. 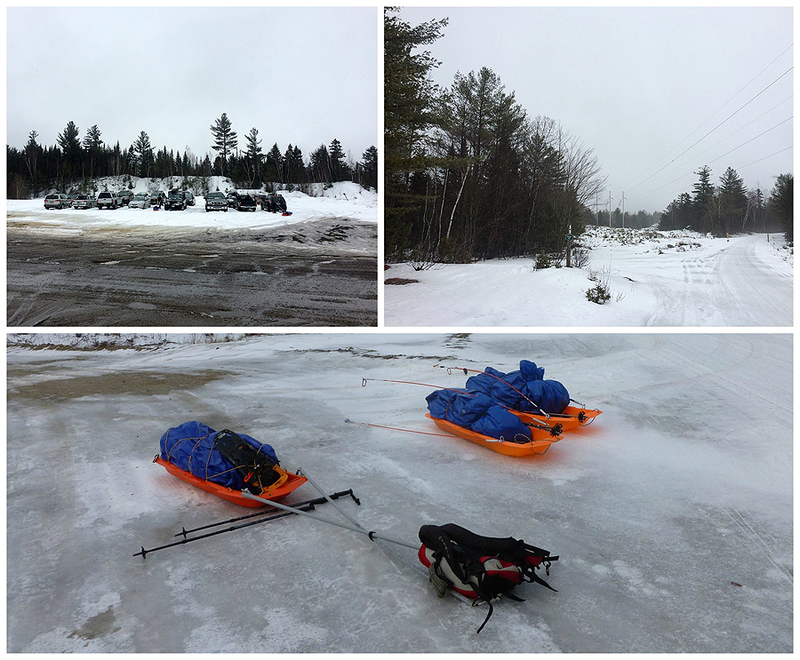 We both then packed our food and gear into big backpacks and wrapped them in tarp and into the sled. Instead of pulling our sleds with a harness belt we both used smaller packs and clipped the poles to our packs. 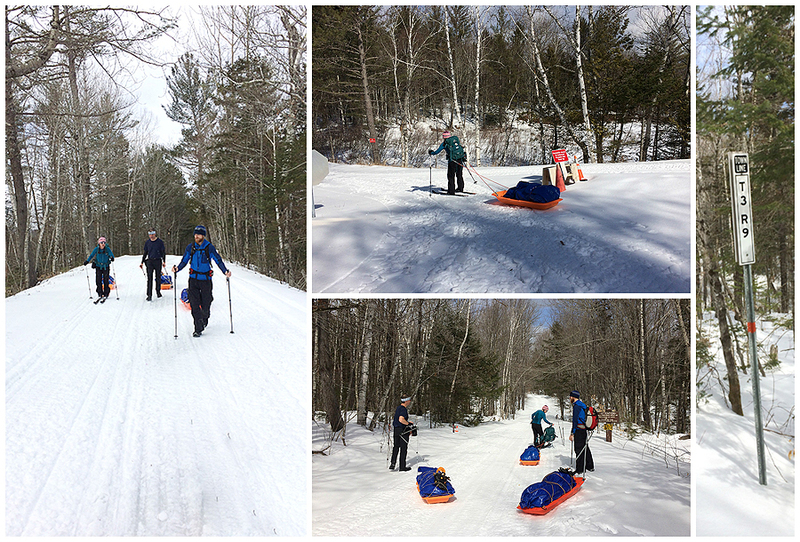 The pulks worked fine, although I'm going to fine-tune it for next year by copying Tim's method of adding something underneath to stop the sled from moving left or right on the steeper down hills. 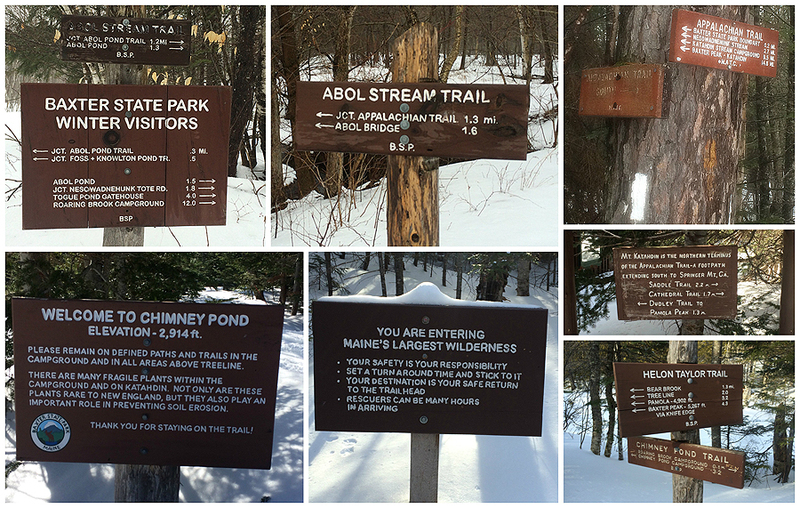 - From the Golden Road we hooked onto the Abol Stream Trail for a mile and a half to the Tote Road. Whitney and I started out on our skis but that didn't last long for me as I took them off after about a mile since I could hike faster without them because the trail and road was icy and choppy. Whitney faired better and skied the flats and downs and hiked the ups for most of the way in. - We made it to Roaring Brook around 2PM and made ourselves at home in the bunkouse. The bunkhouse has a common area with two benches, a picnic table, a counter, and a wood iron stove. There are two small rooms with six bunks at the far end of the common room. The bunkhouses heat up extremely fast and can take on the feel of a sweat lodge. Luckily for us we were able to maintain a decent temperature throughout our stay. 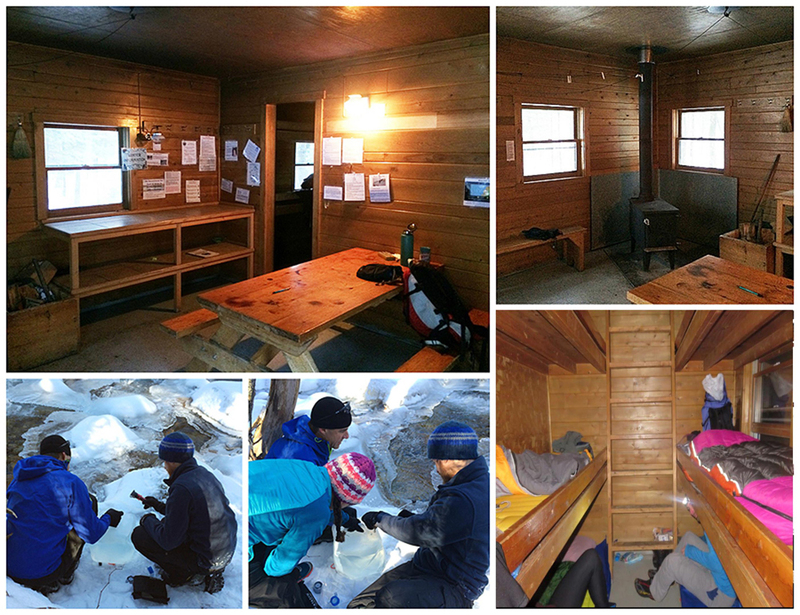 The bunkhouses can become cramped but we lucked out as the first night it was only the four of us and two ice climbers. (Jason and George were coming the next night). - The ranger (Greg) who is based at Chimney Pond came down twice to give us the run down, ask of our plans, and to play us the weather report over his radio. Based on the forecast, Monday looked like wash while Tuesday looked promising so we kept our fingers crossed that Tuesday would be the day to go for it. - Early in the morning the ice climbers headed off to Chimney Pond where they would be spending a few nights in a lean-to. We relaxed for a few hours before heading up South Turner Mountain, a four mile round trip. The trail past Sandy Stream Pond was not broken out and it started to snow, what was forecasted to be one inch turned into three to four, and four to six up higher. 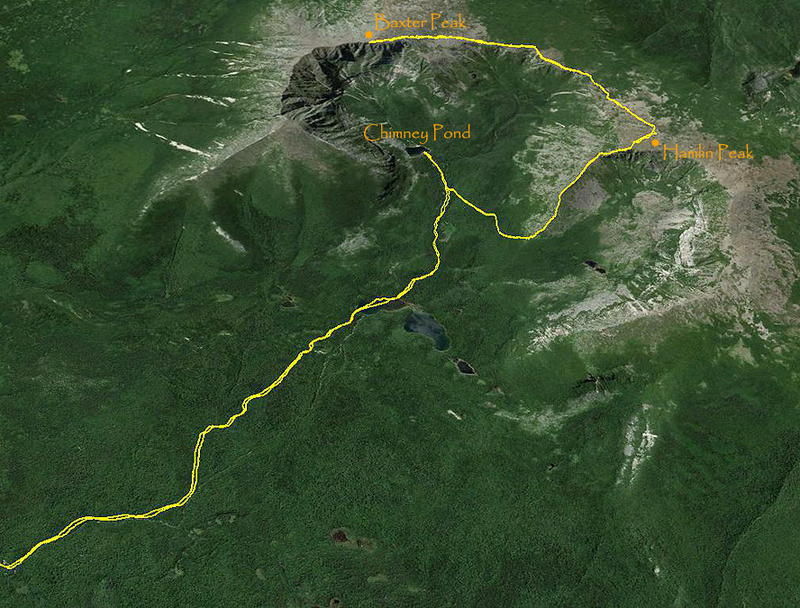 So we broke trail as we got snowed on and then battle the wind up the final exposed quarter mile to the summit. It was a grind of hike but luckily the short miles meant we were back to the bunkhouse early in the afternoon where we cranked up the heat to dry out our clothes. - After making lunch and relaxing for a bit, a group of three arrived for the night, Donna, Heather, and Joyce. They were a great group to have in the bunkhouse, with lots of hiking experience, Donna was finishing her Winter New England Hundred Highest on Baxter. 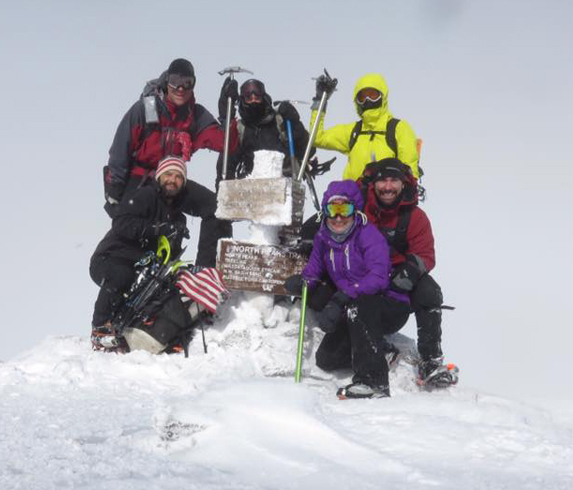 Originally their plans were to head into Chimney Pond on Tuesday and spend a few nights at the lean-tos and make the attempt to summit on Wednesday or Thursday. However, when the ranger played the weather report for us, Tuesday looked like the only good day to climb while Wednesday looked horrendous and Thursday was unsettling. So they chose to change up their plans a bit and go for the summit from Roaring Brook on Tuesday and return and stay at the lean-tos here instead of Chimney Pond. - While all this was playing out Gerorge and Jason arrived, both looking to finish off their Single Season Winter New England 67 list, something that has only been completed six times. - 5AM we all head out along the Chimney Pond Trail in the dark hoping that the weather would be on our side. The forecast for Baxter Peak at 5,267 feet was for the following; mostly cloudy skies becoming partly sunny, temperatures around freezing, winds 25 mph early with higher gusts while dropping throughout the day. - The first three miles was an easy hike over the trail that had been packed down by the ranger's snow mobile. 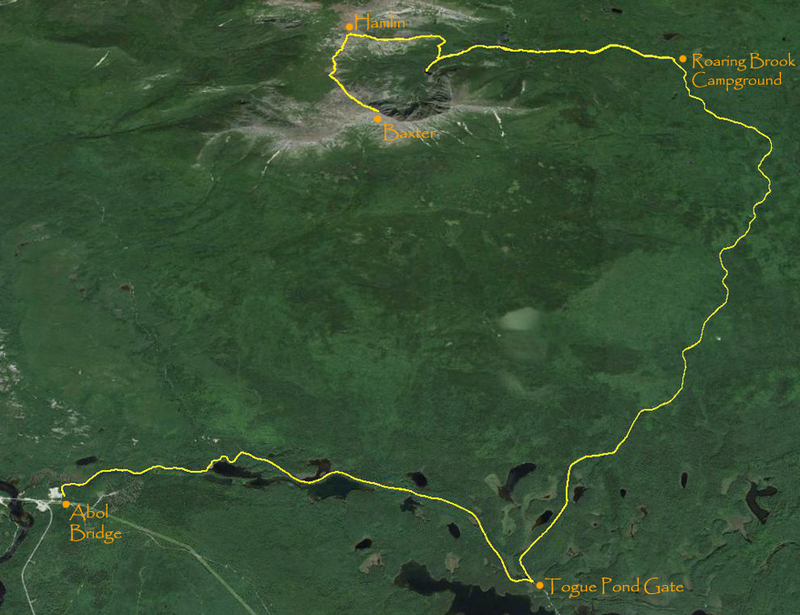 The Chimney Pond Trail in the winter has a deviation here and there from the summer route, most notably is the really cool walk across Basin Pond where you get a real nice view of the North and South Basin below the peaks of Mount Katahdin (Pamola, South, Baxter, Hamlin, Howe). - After passing the pond we made our way up to the North Basin Trail where we started to break trail over to Hamlin ridge Trail. The trail breaking continued with Whitney and Kyle leading the way, luckily the trail emerges from treeline quickly and the while the trail breaking continued the ridge is wind swept so the snow wasn't that deep after the first half mile. - The Hamlin Ridge Trail is a steep boulder 'stair master' narrow ridge with dramatic views into the north and south basins. As we made our way up we initially had no views as we were in thick clouds and high winds, the goggles went on, the crampons and ice axes came out, and we plodded our way up the ridge. I was able to stay in my Dion snowshoes, which are quite small and have ice cleats on them, so I was able to maneuver between the snow, ice, and rocks without having to switch over to crampons until the descent. If I was wearing my Tubbs Flex Alps I would have switched over right away as they're too big and clumsy for safe passage over that terrain. - About a quarter mile from the summit of Hamlin Peak the clouds cleared off ever so slightly for a few seconds revealing the Knife Edge betweeen Pamola and South Peak across the South Basin. It was quite the scene, and as we made our way to the summit of Hamlin Peak then turned towards the Tableland the clearing off of the clouds made for some of the most dramatic and phenomenal hiking experiences of my life! 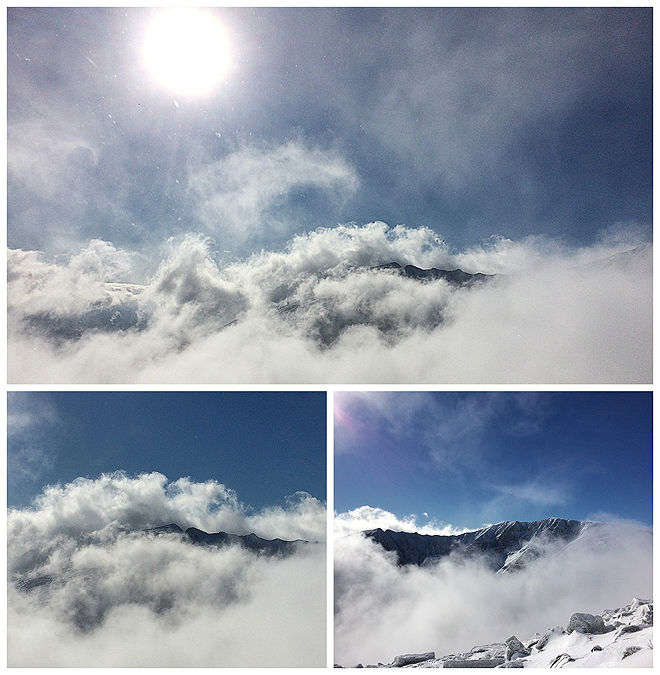 - The clouds kept breaking up as we approached the Saddle, shortly thereafter the sun was shinning abundantly above us while leaving a beautiful undercast to the south and west. - Conditions were now perfect as we made the final ascent up to Baxter Peak over the steep snow fields past the Cathedral Cutoff to the summit sign. The wind was whipping pretty good at the summit but the temperatures were warm enough that it was fine to stand around and snap a bunch of pictures and roam around for about twenty minutes. - Views from the summit of Baxter Peak are out of this world, the Knife Edge looms just past the summit like a gothic sculpted masterpiece as its jagged rock walls fall steeply down into the South Basin to Chimney Pond. In the winter the steep rock walls are a mix of behemoth ice bulges, snow fields, and wind swept slab and jagged rock. It looks oh so daunting and intimidating. 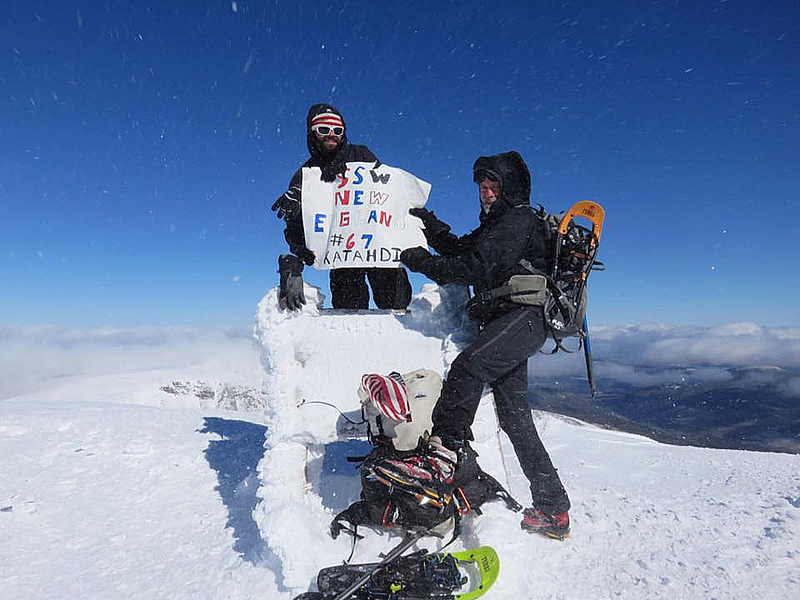 - Our time at the summit was filled with a special moment as we witnessed Jason and George finish their SSW67, and George also finished his winter NE111 (115). Jason made a sign for the finish which was pretty funny as it got beat up by the wind as he held it, looked like someone chewed off the side of it! - After taking it all in from the summit we retraced our steps. We ran into Donna, Heather, and Joyce about a half mile from the summit where Jason handed off the poster to Donna. Jason made a NEHH Winter finish sign on the other side of the poster so Donna now took it with her for one of her summit photos. - The descent back over the Tableland and Hamlin Ridge was magnificent, we went at a slow pace and kept taking in all the views which I will never forget. The wind also became non-existent and it was so warm and sunny that it felt like summer, complete with some sun burn on our faces to boot! - Unfortunately after a few hours we were back below treeline, but there was still one last big view to capture as we made a side trip to Chimney Pond to take in the powerful views from the bottom of South Basin. 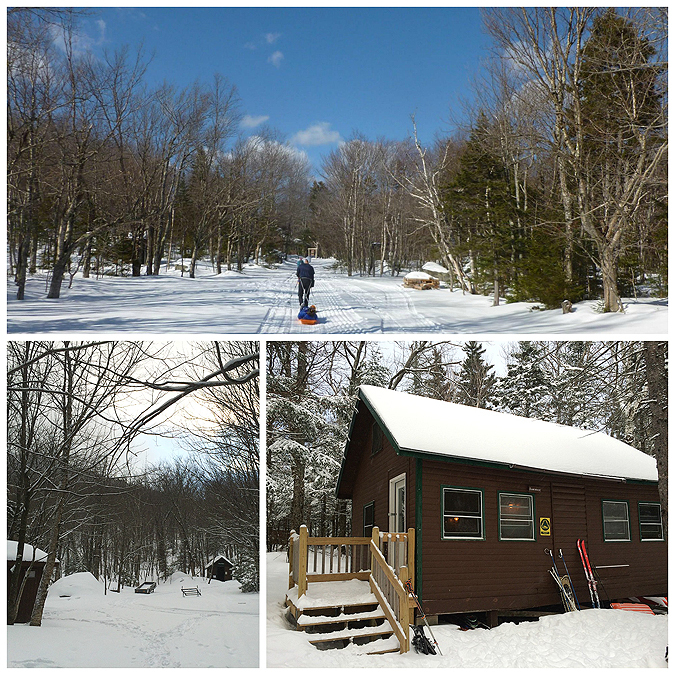 - At Chimney Pond we talked to the ranger before making our way back to Roaring Brook. 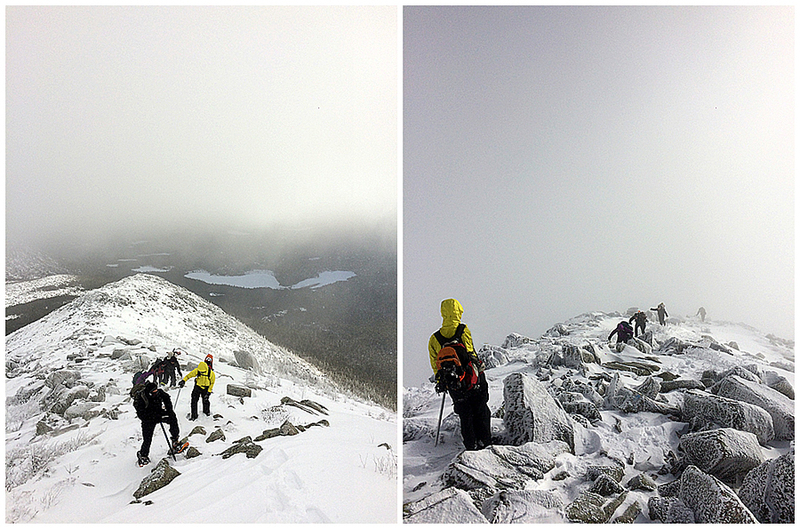 It was a nice and easy hike back out as as thin layer of clouds slowly started to creep back towards Mount Katahdin. We couldn't have timed our hike perfectly and we are all very lucky to have been able to share such a special hike with a very supportive group of hikers. The Knife Edge in view! The sun is about to dominate the sky for the day! Jason and George celebrate an incredible accomplishment! Tim and Kyle take it all in, what a day! Elevation Profile for the sled pull in, two hikes (South Turner & Katahdin), and the sled pull out. I added South Turner in myself, I didn't keep a track of it so it's not 100% accurate but it's in the ballpark! Sweet! What an awesome adventure! Thanks, Rick. It was an amazing hike. 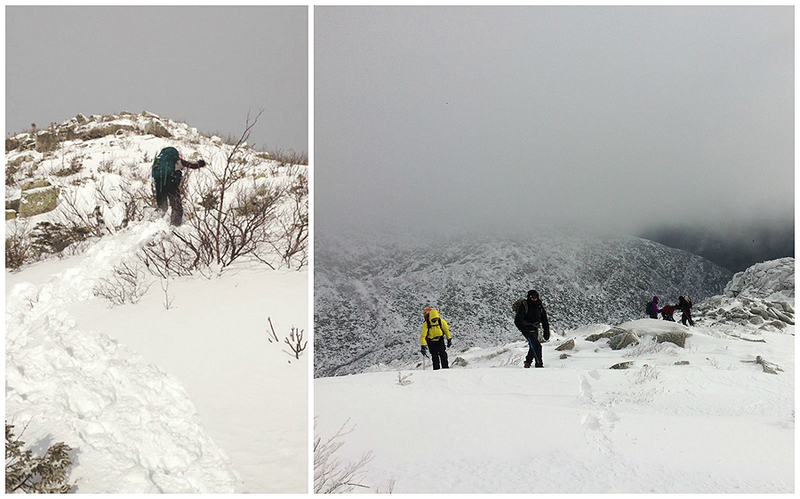 Hope you've had a nice winter hiking down south! Hi Wendy, always glad to hear that you liked the report and pictures! It was a great group to share the experience with hiking the big one! 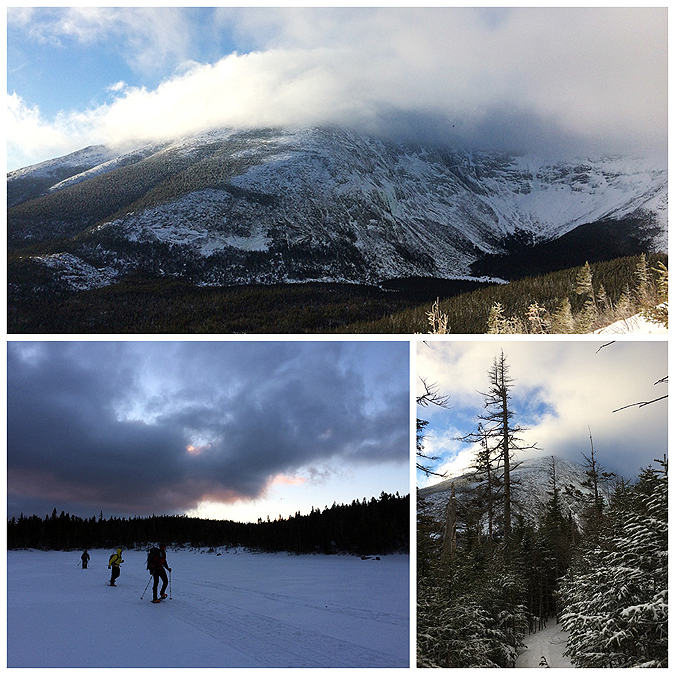 Hope you have a great experience next winter in Baxter State Park. Glad you liked the pictures! Congratulations to you and everyone in the group! Thanks for sharing such a great adventure and all the fantastic scenery of such a special place. 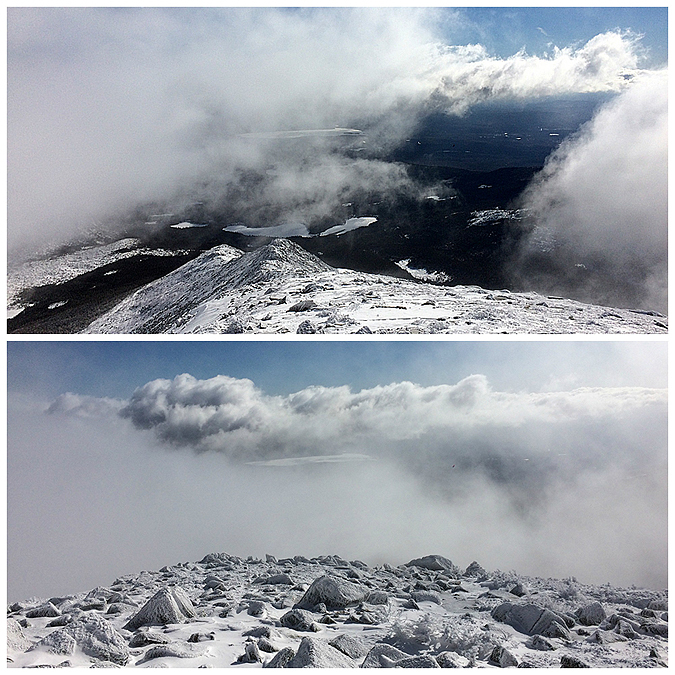 These are some amazing photos of Katahdin.